Yesterday I read David Brooks editorial about the mediated man and his allegation that because Mr. Snowden’s life is “unshaped by the mediating institutions of civil society”, Mr. Snowden sees his battle as that between “the solitary naked individual and the gigantic and menacing state” and that he would be “more likely to share the distinct strands of libertarianism that are blossoming in this fragmenting age”. Since I had just read Thomas Paine’s “Common Sense” on Sunday, I was surprised with his analysis. It is as if Mr. Brooks borrowed the idea of mediating institutions from “Common Sense” and then promptly forgot that Thomas Paine used this “common sense” to argue against the absurdities of British rule. Thomas Paine did not mince his words. He was at least as vehement about the absurdities of British rule as Mr. Snowden has been about the absurdities of blanket data gathering by the U. S. government. Here is the opening paragraph of “Common Sense”. “Common Sense” was popular in 1776 because common people could hold two common sense thoughts in their minds at the same time. For many of them their life was “embedded in a series of gently gradated authoritative structures: family, neighborhood, religious group, state, nation and world” and yet at the same time, they were very concerned about abuses by the British government. Their response surprised many of the pundits of that day since it was both measured and civil to “the gigantic and menacing state”. I guess that it is not surprising that Mr. Brooks would make the same mistake. Random acts of violence was no longer a solution for the common man. 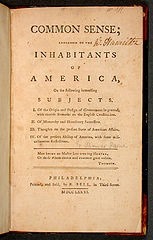 Within a short period of time this common sense argument had initiated a public debate about independence from England which resulted in the Declaration of Independence. For today’s generation Mr. Snowden is their voice just like Mr. Ellsberg was the voice of the Viet Nam war generation. Here is the part of the David Brooks article I quoted.